The Koch brothers are at it again. Their right-wing political Panzer Division descended on a New York City hospital over the weekend to protest (!) the addition of a new ambulatory care center. What the hell, Koch bros? Why not pro-America? Sorry. That’s not quite right. 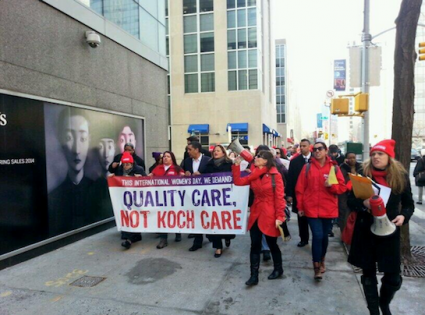 In fact, it was the New York State Nurses’ Association, the NAACP New York State Conference, and SEIU Local 1199, among others, who marched on the soon-to-be-built David H. Koch Center at New York-Presbyterian Hospital, which was funded in part by a $100 million donation from the man one prominent liberal recently predicted would go down in history as a "famously evil person." The donation was the largest in the hospital’s history, and will presumably create a fair number of new nursing jobs. So why are the usual suspects up in arms? Well, the agitators were apparently agitated because this particular hospital didn’t need all the money. Oh yeah, and because it was International Women’s Day, and the Kochs are the primary funders of the "war on women’s reproductive rights … and many other issues of concern to American women." They’re also behind "the effort to defeat and repeal healthcare to all Americans," whatever that means. Just to be clear: Kallos is a sitting city council member who attended a protest against the addition of a new hospital care center in the neighborhood he represents because … Koch brothers! The Washington Times reported last week that former President Bill Clinton accepted a $225,000 speaking fee from the Washington Hospital Center in 2012, the same year the hospital laid off 300 employees, on top of the 200 layoffs announced in 2011. The information was disclosed in Hillary Clinton’s final ethics filings as secretary of state, and was just one of several dozen well-paid speaking gigs reported by the former president. The local SEIU affiliate representing the hospital workers wasn’t too happy about it. "No disrespect to Bill Clinton, but that money could’ve gone a long way and been put to better use," said Dan Fields Jr., president of the Service Employees International Union Local 722. "Our contract expires on June 30, and I’m pretty sure they’re going to come to the table and talk about how they’re losing money, so this concerns me greatly." But first and foremost: No disrespect to Bill Clinton. He just wanted to make that clear. It's not like the former prez did anything shameful, like actually donate money to the hospital. Keep an eye out for the details about the forthcoming march on the Clinton’s multi-mullion-dollar Georgetown mansion. Or don’t, because something like that actually happening would suggest an ideological coherence not readily apparent in the type of person who would protest a rich guy’s hospital donation while singing a song about sending that rich guy to prison. Final thought: It’s pretty great to live in a country where this is the sort of thing that inspires people to take to the streets in protest, especially given recent events around the world. Protestors in Ukraine, for example, just fought a medieval trench war with armed riot police to oust Victor Yanukovich—an actual, real-life version of the liberal caricature of David Koch—and are currently trying to prevent a kleptocrat dictator from stealing part of their country.